True story. 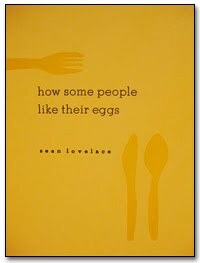 I was sitting on a train, coming home from work, and I was reading How Some People Like Their Eggs. It’s a cute chapbook to look at – a slim, yellow (yolky?) cover with beautiful black lettering. I’d read it through and was flipping back and forth a little. Then some youngish male started singing to me “How do you like your eggs? I like mine fried and on top of toast.” His friend looked at him baffled and I did one of those tight half smiles trying to be friendly not stand-offish, but not wanting further interaction. Still his friend joined in and sung about scrambled eggs. And I wasn’t surprised, it seemed like just the sort of thing that would happen to someone reading a Sean Lovelace book. I don’t want to spoil things as I think you should probably head over to Rose Metal Press and buy yourself a copy. To persuade you I will say that “Charlie Brown’s diary: excerpts” managed to surprise me, amuse me, and leave me marvelling at Sean’s wit. It’s that “Silty” that casts the spell I think. I loved reading how Anne Sexton likes her eggs. Sean Lovelace blogs here and I recommend his blog to anyone who gives a damn about fiction. He seems to be a thoroughly good egg. Har har. Next Post Dear writers, wanna see Sparks fly? Great recommendation Sara. No jokes about it sounding egg-stra special. But I'm sure there will be a scramble to get hold of a copy.Sorry. oh god. .but yes, it does sound nice, raw or cooked. I applaud spontaneous singing in public and Sean's Chapbook 🙂 The world needs so much more of both. Julia! please, no more eggstremely bad jokes please!And Vanessa – I expect better from you!Rohan – the singing was dodgy, the chapbook was not! (Sheez, the exclamation police are gonna be after me.)! Rachel that's not eggs-actly the sort of comment I was hoping for.